It is the largest Lutheran denomination in Europe and the third-largest in the world after the Ethiopian Evangelical Church Mekane Yesus and the Evangelical Lutheran Church in Tanzania. A member of the Porvoo Communion, the Church professes the Lutheran branch of Christianity. It is composed of thirteen dioceses, divided into parishes. It is an open national church which, working with a democratic organisation and through the ministry of the church, covers the whole nation. The Primate of the Church of Sweden is the Archbishop of Uppsala — currently Antje Jackelén, Sweden's first female archbishop. Today, the Church of Sweden is an Evangelical Lutheran church. It is liturgically and theologically "high church", having retained priests, vestments, and the Mass during the Swedish Reformation. In common with other Evangelical Lutheran churches (particularly in the Nordic and Baltic states), the Church of Sweden maintains the historical episcopate. Some Lutheran churches have congregational polity or modified episcopal polity without Apostolic succession, but the historic episcopate is maintained in Sweden and the other Lutheran nations of the Porvoo Communion. The Church of Sweden is known for its liberal position in theological issues, particularly the question of homosexuality. When Eva Brunne was consecrated as Bishop of Stockholm in 2009, she became the first openly lesbian bishop in the world. Despite a significant yearly loss of members (lately 2% annually), its membership of 5,993,368 people accounts for 59.3% (yearend 2017) of the Swedish population. Until 2000 it held the position of state church. The high membership numbers are because until 1996 all newborn children were made members, unless their parents had actively cancelled their membership. Approximately 2% of the church's members regularly attend Sunday services. According to a Gallup poll conducted in 2009, 17% of the Swedish population considered religion as an important part of their daily life. Church of Sweden's official response to the "Lima document"
In 2000 the Church of Sweden ceased to be a state church, but there remains a strong tradition of community connection with churches, particularly in relation to rites of passage, with many infants baptized and teenagers confirmed (currently 40% of all 14 year olds) for families without formal church membership. Other changes of the reformation included the abolition of some Catholic rituals. However, the changes were not as drastic as in Germany; as in Germany Swedish churches keep not only crosses and crucifixes, but also icons and the traditional Mass vestments which in Germany were usually discarded in favor of the black preaching gown and stole until recent times. And many holy days, based on saints days, were not removed from the calendar until the late 18th century due to strong resistance from the population. The New Testament was translated to Swedish in 1526 and the entire Bible in 1541. Revised translations were published in 1618 and 1703. New official translations were adopted in 1917 and 2000. Many hymns were written by Swedish church reformers and several by Martin Luther were translated. A semi-official hymnal appeared in the 1640s. Official hymnals of the Church of Sweden (Swedish: Den svenska psalmboken) were adopted in 1695, 1819, 1937 and 1986. The last of these is ecumenical and combines traditional hymns with songs from other Christian denominations, including Seventh-day Adventist, Baptist, Catholic, Mission Covenant, Methodist, Pentecostalist, and the Salvation Army. In October 2013, the Church of Sweden elected Antje Jackelén as Sweden's first female archbishop. The groups that take part in the elections are called nominating groups (Swedish: nomineringsgrupper). In some cases the nationwide political parties take part in the elections, such as the Social Democrats and the Centre Party. 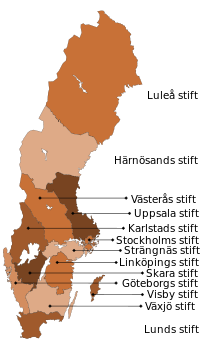 After the formal separation of Church of Sweden from the State of Sweden, the growing tendency in the elections is towards independent parties forming for candidature, either based on a political conviction, for example Folkpartister i Svenska kyrkan founded by Liberal People's Party members, or a pure church party such as the political independents' Partipolitiskt obundna i Svenska kyrkan (POSK) and Frimodig kyrka. The Church of Sweden maintains the historic threefold ministry of bishops, priests, and deacons, and has approximately 5,000 ordained clergy in total. It practices direct ordination, also called ordination per saltum (literally, ordination by a leap), in which candidates are directly ordained to the specific Order of ministry for which they have trained. This is an alternative approach to the sequential ordination of other historic churches (including the Anglican, Orthodox, and Roman Catholic churches) in which candidates must be ordained in the strict sequence of deacon, then priest, then bishop. A Church of Sweden priest will be ordained directly to that office, without any previous ordination as a deacon. In the history of Holy Orders direct ordination seems to have been commonplace in the Church before the fourth century, whilst the two systems (direct ordination and sequential ordination) seem to have co-existed in different places, until the eleventh century, when sequential ordination became universally normal and requisite, under Pope Gregory VII (1073-1085). The Church of Sweden employs full-time deacons to staff its extensive outreach and social welfare diakonia programme. Whilst deacons have the traditional liturgical role (and vesture) in the Swedish Church, their principal focus of work is outside the parish community, working in welfare roles. Nonetheless, deacons are attached to local parishes, and so connected with church communities, and with a parish priest. In common with other western rite churches, the clergy of the Church of Sweden wear clerical shirts which are black for priests and purple for bishops. Unlike other denominations, however, the Church of Sweden officially promotes green clerical shirts for its ordained deacons, as a further distinctive sign of their ministry. At the parish level a parish is called församling. A more archaic term for a parish in Swedish is socken, which was used both in the registry and in the church administration. After the municipal reforms in 1862 the latter usage officially was replaced with församling, a term somewhat meaning "congregation", originally and still used for the Lutheran territorial and nonterritorial congregations in cities and also for other religious congregations. One or several parishes are included in a pastorat with a head minister or vicar called kyrkoherde (literally "church shepherd") and sometimes other assistant priests called komminister (minister). At a cathedral an assistant minister is called domkyrkosyssloman. In addition to the 13 dioceses, the Church of Sweden Abroad (Swedish: Svenska kyrkan i utlandet - SKUT) maintains more than 40 overseas parishes. Originally a collection of overseas churches under the direction of a committee of the General Synod, SKUT was remodelled from 1 January 2012 with a quasi-diocesan structure. Under this remodelling it gained a governing Council, constituent seats on the General Synod of the Church of Sweden (like the 13 mainland dioceses), and for the first time full-time deacons to provide a programme of social welfare alongside the work of priests and lay workers. :20 However, SKUT does not have its own bishop, and is placed under the episcopal oversight of the Bishop of Visby. The Diocese of Kalmar existed as superintendentia 1603–1678 and as a diocese between 1678–1915 when it was merged with the Diocese of Växjö. Another diocese which no longer exists is the Diocese of Mariestad which existed as superintendentia between 1580–1646 and was replaced by the Diocese of Karlstad. Since 1994 the Church of Sweden has been part of the Porvoo Communion, bringing it into full Communion with the Anglican churches of the British Isles and the Iberian Peninsula, together with the other Lutheran churches of the Nordic nations and the Baltic states. In 1995 full communion was achieved with the Philippine Independent Church. Since 2015, the Church of Sweden has also been in full communion with the Episcopal Church of the United States. In 2016, the Church of Sweden reached full communion with the Old Catholic churches within the Union of Utrecht. ^ a b c d "Svenska kyrkan i siffror". Svenska kyrkan (in Swedish). ^ Wockner, Rex. "Lesbian bishop consecrated in Sweden". QX. QX Förlag AB. Retrieved 20 July 2014. ^ Wendy Sloane (1995-10-04). "Sweden Snaps Strong Ties Between Church and State". The Christian Science Monitor. Retrieved 2016-01-15. ^ "Church of Sweden says yes to gay marriage". The Local: Sweden's News in English. 2009-10-22. Archived from the original on 2012-01-11. Retrieved 2012-06-03. ^ "Sweden elects its first female archbishop, the German-born bishop of Lund – Fox News". Fox News Channel. 15 October 2013. ^ Gold is represented as yellow in non-metallic representations of coats of arms. ^ Structure and numbers of clergy listed on the official website in English. ^ Hallenbeck, Edwin (1996). The Orders of Ministry: Reflections on Direct Ordination (First ed.). North American Association for the Diaconate. ^ a b "Direct Ordination". The Episcopal Church of the United States of America. Retrieved 19 February 2017. ^ "Report of the Commission Appointed by the Archbishop of Canterbury, In Pursuance of Resolution 74 of the Lambeth Conference of 1908 on the Relation of the Anglican Communion to the Church of Sweden". The Young Churchman (1911), reproduced by Project Canterbury. Retrieved 19 February 2017. ^ Whitelocke, Bulstrode (1772). A Journal of the Swedish ambassy in the years MDCLIII and MDCLIV from the Commonwealth of England, Scotland and Ireland : with an appendix of original papers, written by the ambassador, the Lord Commissioner Whitelocke (1772 republication ed.). ^ Pädam, Tiit (2011). Ordination of Deacons in the Churches of the Porvoo Communion: A Comparative Investigation in Ecclesiology (First ed.). Kirjastus TP (Uppsala). ISBN 978-9949-21-785-4. ^ See report Mobilise the Greenshirts!. ^ a b c d e Kyrkoordningen (in Swedish) (internal church regulations). ^ A pastorat is a subdivision within the Church of Sweden. A pastorat includes one or several parishes. Similar to a Norwegian Prestegjeld. ^ Anders Wejryd, Archbishop (2012). 2011 Review and financial summary for the Church of Sweden, national level (First ed.). Trossamfundet Svenska kyrkan. Gustafsson, Berndt (1983) . Svensk kyrkohistoria. Handböcker i teologi (in Swedish) (6th ed.). Helsingborg: Plus Ultra. ISBN 91-970355-7-2. LIBRIS 7791193.